The train starts its journey from Chhatrapati Shivaji Terminus, Mumbai in the evening. Mumbai - The Indian film city is famous for Gateway of India built in 1911 to commemorate the visit of King George V and Queen Mary for the Delhi Durbar. Prince of Wales Museum exhibits antique articles of art, sculpture, china, rare coins, weaponry and miniatures. Kamala Nehru Park and Hanging Gardens are cool while Marine Drive is the hip-hop area of the town with the top-notch night life. Morning arrival at Bhoke Railway Station. Air-conditioned bus ride to Rai Bhatgaon Jetty for Back Water Cruise to Jaigad Fort. Bus ride to lunch point and free time to relax. Noontime sightseeing tour of Ratnagiri town (the birthplace of great Indian freedom fighter Lokmanya Tilak) including Ratnadurg Fort, Lokmanya Tilak Smarak and Ratnagiri Bazaar. Train leaves in the evening from Ratnagiri Railway Station. Morning arrival at Karmali, Goa. Sightseeing tour of Old Goa including Basilica De Born Jesus, Se Cathedral, Se Cathedral and Church of St. Francis of Assissi. Bus ride to Panjim to visit Dona Paula. Train leaves in the evening from Madgaon Railway Station. Morning arrival at Aurangabad station. 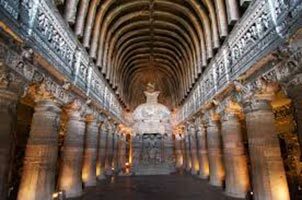 Visit the historical fort of Daulatabad and world-renowned Ellora caves. After lunch, sightseeing tour of Aurangabad including Shivaji Museum, Aurangabad Caves No. 7 & 8, Bibi-ka-Maqbara and shopping at Paithani, Himroo, and Bidriwork. Train leaves late in the evening from Aurangabad Railway Station. Morning arrival at Jalgaon Railway Station. 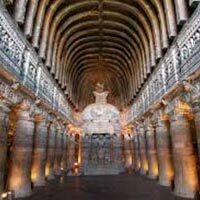 After breakfast, sightseeing tour of Ajanta caves. Train leaves in the noontime from Bhusalwal Railway Station. Lunch onboard. Arrival at Nashik Railway Station. Visit Panchawati Ghat and Sula Winery Yard, where you are served with dinner and wine. Train leaves late in the night from Nashik Railway Station.